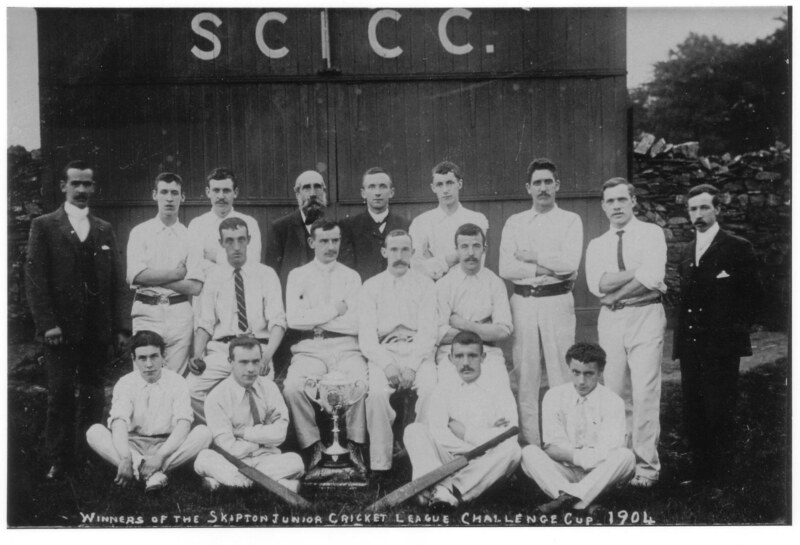 Winners of Skipton Junior Cricket League Challenge Cup, 1904. Thanks, Chris. Have ammended the title to 'Skipton Church Institute Cricket Club'. Admin. I am interested in the location of CI's ground at this time. In conversation with a CI stalwart - Peter Clark - the team used to play somewhere between the castle woods and the Embsay road, but where exactly I haven't quite fathomed. Church Institute used to play at "The Showfield" which was the field in which Skipton Show used to be held. The field is just on the Embsay Road just off the the main Skipton to Harrogate Road, by the lay-by at the top of the hill. The Club moved from there to Sandylands in the 1940's I think, first of all playing on what is now the LMS field, before moving to the current ground. I had seven very happy years playing cricket with the Church Institute from approx 1954 to 1961. As opposed to many other clubs the Institute always welcomed newcomers and gave them a chance. In Frank Surgener, Peter Clark, FrankTitterington, Stan Reed and many others , the Club had the type of personalities that made Saturdays a very special time of the week in the Summer months. I wish the Club well and am delighted to know that they are still soldiering on and I have no doubt that the proper spirit of cricket will still be respected. With best wishes from the "soft South " A Yorkshire man in exile. I unfortunately forget to mention the stalward second team captain Stanley Barker whose greatest story (even if second hand to him) was of the entire team taking the heavy roller from the old showfield location to the new Sandilands Home. This of course entailled a hair raising journey down Skipton High Street, up over the canal bridge and down the steepish hill past Dewhurst mill.Apparantly "due refreshment" was taken at most of the pubs that then dominated Skipton High St. Some "pushers" agreed to push as far as their own local pub where they guaranteed further labour would be made available - and it usually was. Amazingly no one was injured and little or no damage caused. If any of the "pushers" were alive now they would be astonished at the fuss made and the costs involved in organising a simple road race for a few men on bikes. Times change! !